Sri Sankara Senior Secondary School was founded in 1970 and was blessed by His Holiness Sri Sankaracharya of Kanchi Kamakoti Peetam. It is a co-educational institution with a strength of over 2000 students and is affiliated to the Central Board of Secondary Education, New Delhi. The unique feature of Sri Sankara School is that it symbolizes the ideals of education expressed in our scriptures and literature, in building discipline and character, encouraging appreciation of our cultural heritage and cultivation of genuine devotion to God, respect to Guru, parents and elders. Sanskrit, the repository of our culture is given a special status in this school. The school offers combinations of subjects like Mathematics, Physics, Chemistry, Biology, Bio-Technology, Informatics Practices, C++ in the Science Stream, Economics, Business Studies, Accountancy, Mathematics or Geography, Entrepreneurship in the Commerce Stream, and Economics, Psychology, Sociology, Maths or Geography in the Humanities Stream in XI and XII Standards. Apart from Sanskrit, Hindi and Tamil, the school offers French also as second language at the Secondary level. Sri. T.R. Meenakshisundaram was at the helm from 1977 to 1993 and was responsible for putting the school on a firm foundation. He was followed by Sri. S.R.Santhanam (1993-97), Mrs.Ramaa Swaminathan (1997-2004) and Mrs. Subala Ananthanarayanan (2004-2015). Mrs. Mita Venkatesh has taken over as Principal in July 2015. The school has Interactive class rooms and a Mathematics laboratory with technological support from NIIT. The school has well equipped Science laboratories, English Language lab, Geography lab and Computer labs for primary, junior and senior students. The school constantly strives to implement innovations in teaching and evaluation, keeping pace with the global trend in education. The school has received the International School Award from the British Council in 2006, 2010 as well in 2014. The school also received the ISO 9001:2008 accreditation in January 2008 and has periodic recertification and surveillance audits. 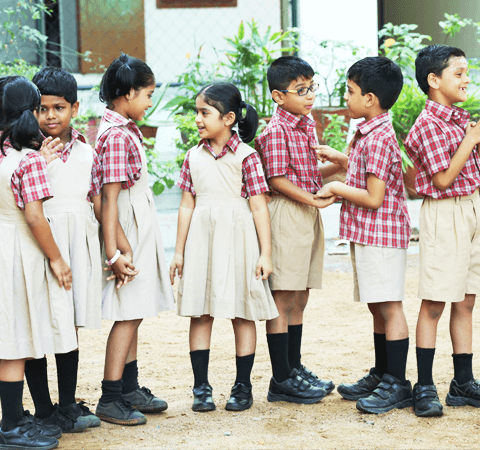 The school conducts several programmes in collaboration with Rotary International, the British Council, Indian School Debating Society, INTACH and The Energy and Resources Institute. Apart from these, the NCC Girls’ wing, the Young Indian Net, the Model United Nations programmes and the Mock-Parliament and the Gavel Club are special features of the school that contribute to the overall personality development of the students. The students passing out of our school enter prestigious professional institutions. Our Alumni can boast of Engineers, Doctors, Scientists, Teachers, Chartered Accountants, Business Executives and Artistes settled in several parts of the globe. They continue to serve the school since they feel that their Alma Mater is a sustaining and inspiring force. Sri Sankara Senior Secondary School is committed to providing the students with a sound academic foundation and ensuring their overall development as responsible global citizens in a stress – free and secure environment.